Note: Credit Card and PayPal orders are processed through our online retailer CCNow. International orders please contact us for a shipping quote. Traditional / Travel size 14" x 21"
includes Poly / cotton pillow case. Extra Pillow case(s) for Makura Traditional size. Although the hulls should last 6-8 years, you may want to replace a worn out liner sooner. These are available if you need. a natural buckwheat hull filled adjustable cervical pillow. This information is not to be considered medical advice.Please consult your health care professional. 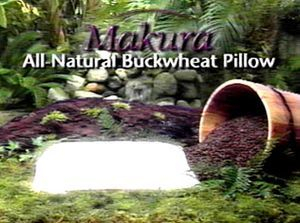 The MAKURA Miracle Pillow is a 100% Natural buckwheat hull filled adjustable orthopedic cervical pillow. The MAKURA Miracle Pillow is commonly prescribed by health care professionals for the relief of neck pain, back pain, headaches, muscle tension, snoring, TMJ syndrome, cervical and lumbar subluxations, torticolis, sleeplessness, and other conditions. The pillow may be purchased by individuals without a prescription. For sleeping on your back you simply make a little indentation in the center for your head and the pillow will automatically support your neck in the proper position (normal cervical lordosis). For sleeping on your side you leave the pillow flat under your head and up close to your shoulder, this will keep your head and spine parallel while providing the proper neck support. The pillow will conform to your contours as you move around during the night. 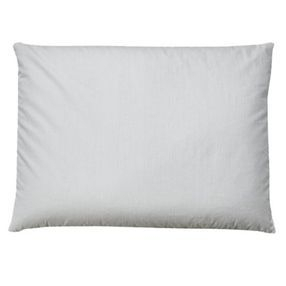 We do not recommend ever sleeping on your stomach with this or any other pillow because that twists your neck, and puts strain on your lower back, legs and ankles. The first few nights you might take a little getting used to the pillow because it feels different than other pillows you may be used to and because your body correcting the alignment of your neck (Doctors call this Normal Cervical Lordosis). The pillow is also good for people who never use any pillows because most pillows provide too much bulk lifting your head too far off the bed, but the Makura lets your head rest close to the bed. The Traditional size Makura has a zippered inner liner of 180 thread count poly/cotton and also includes its own poly / cotton pillow case. The Makura XL uses a zippered liner of 200 thread count 100% cotton. On the Makura XL size you can use your own 'Standard' size pillow cases. HELP NECK PAIN, AND MUSCLE TENSION? When sleeping on a Makura Miracle Pillow, all the muscles and tendons are relaxed and in their preferred position of proper cervical curve (normal cervical lordosis). The passive and compliant support of buckwheat hulls support the entire head and neck area uniformly. With fiberfill and foam pillows (even those designed to be 'cervical' pillows) there are always areas of the pillow that are more compressed than other areas, which forces your muscles to fight back against the pressures. The relaxation of the shoulder and neck muscles during sleep let the nerves heal from the daily irritation of head, back and arm movements. HOW DOES THE MAKURA MIRACLE PILLOW HELP HEADACHES? The complete and almost immediate relaxation of your muscles while laying on a buckwheat hull pillow, tends to lower blood pressure, which is a major cause of stress related headaches. HOW DOES THE MAKURA MIRACLE PILLOW HELP SNORING? With the head fully back and the neck properly supported, airway passages are more opened and less restrictive. The Makura Miracle Pillow seems to work to reduce or eliminate snoring in about half of users. The people who are not helped may have more serious problems such as sleep apnea and are strongly urged to see a qualified health professional as soon as possible. HOW IS THE PILLOW HELPFUL FOR LOW BACK PAIN? When your neck is placed in normal cervical lordosis, your spinal cord is relaxed (shortened), thereby putting less stress on the lumbar nerve roots where they exit the spine. This is often a source of pain when there is any type of disk problems. You can also achieve additional relaxation of the spinal cord when you place a pillow such as the Comfort Roll under your knees. The pillow can also help mid-back (thoracic) pain, but not as much as the upper (cervical) and lower (lumbar) spine. The jaw joint is affected by about 17 different muscle groups. The neck and shoulder muscles play an important roll in the interaction of these muscle groups. The more relaxed the neck and shoulder muscles, the easier it is for the smaller jaw and facial muscles to function properly. As a former TMJ sufferer myself, I also found it nice to be able to make a hollow area in the pillow so it wouldn't even touch the painful sensitive area of my jaw. The Rejuvenator Deluxe pillow is highly recommended for TMJ sufferers. HOW DOES THE MAKURA MIRACLE PILLOW HELP SLEEPLESSNESS? When you lie on a Makura Miracle Pillow and your muscles relax, you tend to fall asleep faster. Many people also find that they don't toss and turn all night long like they did on regular pillows, in fact many people have said they wake up in the same position they fell asleep in and apparently hadn't moved all night. You may even find that you wake up more refreshed and alert with fewer hours of sleep than ever before. There is even some speculation that resting your head on natural buckwheat hull pillows allows the electro-magnetic field of the brain to function normally as compared to the effects of static charge buildup in synthetic fiber, foam, and feather pillows. People have also reported more lucid dreaming while using the pillow.